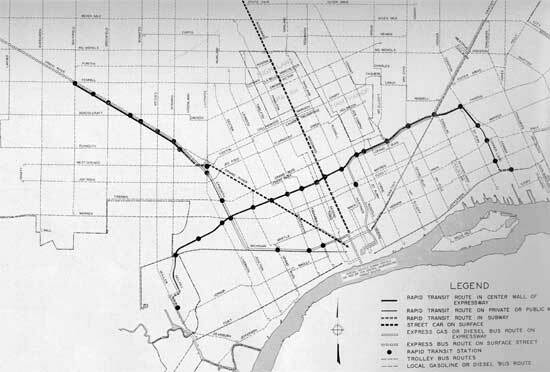 It is always interesting to find old transit plans in Detroit. In 1945, the plan for rapid transit was still young. You can see the East-West route slides down to Jefferson near Conner Ave and seems planned to end where the Jefferson North Assembly Plant is today. This plan I think still holds relevance today because the continued importance of Detroit’s spoke streets and main road arteries. 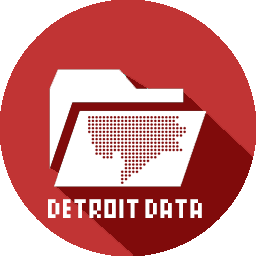 Grand River, Woodward, Gratiot, and Michigan Avenues are all still very busy and key routes in and out of Detroit. What stands out the most from this plan is the various modes of transit: streetcar, trolley, rapid bus routes, and even a planned subway. Just imagine if today the M-10 Lodge Freeway was instead a subway system? How many parking lots would we see Downtown?